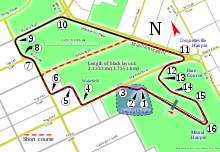 The 1986 Australian Grand Prix was a Formula One motor race held on 26 October 1986 at the Adelaide Street Circuit, Adelaide, Australia. It was the last of 16 races in the 1986 Formula One season, and decided a three-way tussle for the Drivers' Championship. The drivers in contention for the title were; Nigel Mansell, Nelson Piquet, both of whom were racing for the Williams-Honda team, and McLaren's Alain Prost. Mansell took pole position for the race, but a poor start off the grid enabled teammate Piquet, Ayrton Senna and Keke Rosberg to overtake him and demote him to fourth by the end of the first lap. A few laps into the race, Finland's Keke Rosberg, in his final Grand Prix, took the lead from Piquet. However, the Finn retired with a puncture on lap 63, handing the lead back to Piquet and elevating Mansell into third place, which would have been sufficient for the Englishman to secure the championship. One lap later, Mansell's race ended as his left-rear tyre exploded on the main straight with 19 laps remaining. The title was then between Piquet and Prost with the Frenchman needing to finish ahead of the Brazilian to successfully defend his title. Following the tyre failures of Rosberg and Mansell, the Williams team called Piquet in for a precautionary tyre change leaving him 15 seconds behind. He made a late charge to close the gap to 4.2 seconds but Prost took victory to win his second of four titles. It was not until the 2007 Brazilian Grand Prix that there were again three possible drivers' title contenders entering the final race of the season. Going into the race, three drivers were in contention for the World Championship. Nigel Mansell, driving a Williams-Honda, led with 70 points, while reigning champion Alain Prost, driving a McLaren-TAG, was second on 64 and Mansell's teammate Nelson Piquet was third on 63. The Williams-Honda was superior in speed to the McLaren-TAG, with Mansell and Piquet having won nine of the previous fifteen races between them, and the team sealing the Constructors' Championship at the Portuguese Grand Prix in late September. However, Mansell and Piquet had been battling with one another and had taken points from each other on a number of occasions, while Prost's consistency had seen him accumulate points all year and thus remain in touch with the Williams drivers. Nonetheless, Mansell went into the race in the strongest position among the three drivers, needing only to finish third or higher to take the title, while Prost and Piquet both needed to win to have any chance. Mansell took pole position for the race with a time of 1 minute 18.403 seconds. Piquet and Lotus's Ayrton Senna were the only drivers within a second of Mansell's time. Prost was fourth, 1.2 seconds behind. The prospect of a three-way battle for the Drivers' Championship crown attracted a capacity crowd of 150,000 to the Adelaide circuit. Mansell started from pole position but yielded the lead to Ayrton Senna's Lotus at the second corner on lap 1 and fell behind both Piquet and Keke Rosberg on the same lap. Piquet also overtook Senna on lap 1 to take the lead but it would last only six laps as on lap 7, Rosberg took the lead from Piquet and began to build a sizeable gap between himself and the rest of the field. On lap 23 Piquet spun, although no damage was sustained to the car, and he continued the race despite dropping back several places. Prost suffered a puncture a few laps later and he dropped to fourth position after having to pit. Piquet charged back through the field, passing Mansell for second place on lap 44, but Prost closed on the two Williams cars and, with 25 laps to go, all three championship contenders were running together in positions 2, 3 and 4. The battle became one for the lead on lap 63 when Rosberg suffered a right rear tyre failure and retired from the race. Rosberg later revealed that he would never have won the race anyway unless Prost failed to finish or had sufficient problem not to be able to challenge, as he had promised Prost and the team that he would give best to his teammate to help his bid to win back-to-back championships. Prost had just passed Mansell for third which became second when Rosberg retired, with Piquet now leading. Mansell only needed a third-place finish to win the championship. Mansell was still in third position when, on lap 64, his left rear tyre exploded at 180 mph (290 km/h) on the high-speed Brabham Straight when he used his overtake boost to attempt to lap the Ligier of Philippe Alliot, sending a shower of sparks flying behind him and severely damaging his left rear suspension. The Williams coasted to a stop in the run-off area at the end of the straight, Mansell managing to avoid hitting anything. Fearing the same happening to the second car, Williams called Piquet to the pits and Prost took the lead. Piquet would make a late charge, closing the gap from 15.484 seconds with 2 laps remaining to just 4.205 at the finish and Prost claimed both the race and the World Championship. Prost had so little fuel left that he pulled up only metres past the finish line. In his last race for Ferrari, Stefan Johansson completed the podium in third place, albeit a lap down on Prost and Piquet. Martin Brundle ran out of fuel as he crossed the line in fourth place in his Tyrrell-Renault. His teammate Philippe Streiff finished fifth 2 laps down, while Johnny Dumfries finished sixth in his Lotus-Renault. By winning, Alain Prost became the first and so far only driver to ever win the Australian Grand Prix in both non-championship and World Championship form, having won the non-championship 1982 Australian Grand Prix run for Formula Pacific cars at the Calder Park Raceway in Melbourne. This was the last race for the Renault turbo engine, the French company being the pioneers in F1 turbocharging back in 1977, as well as Renault's last Formula One race as an engine supplier until their return with Williams at the 1989 Brazilian Grand Prix. It was also the last Formula One race for Australia's 1980 World Champion Alan Jones and his teammate Patrick Tambay, and the last race for Team Haas, whom both Jones and Tambay drove for. It was also the last race for Lotus driver Johnny Dumfries, Osella's Allen Berg, Zakspeed's Huub Rothengatter, and 1982 World Champion Keke Rosberg. Nelson Piquet 8 (1–6, 63–64), Keke Rosberg 56 (7–62), Alain Prost 18 (65–82). ^ "Australian classic – Adelaide, 1986". Official Formula One website. 31 March 2006. Archived from the original on 13 November 2014. Retrieved 24 January 2016. ^ "Ask Nigel: May 23". AutoSport. 23 May 2001. Retrieved 13 November 2014. ^ "Heartbreak for Mansell in dramatic Adelaide finale". F1Fanatic. 18 October 2007. Retrieved 13 November 2014. ^ "1986 Australian Grand Prix". formula1.com. Archived from the original on 13 November 2014. Retrieved 23 December 2015. ^ a b "Australia 1986 - Championship • STATS F1". www.statsf1.com. Retrieved 6 March 2019.